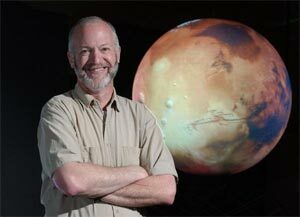 Planetary scientist Bruce Jakosky is the principal investigator of a $485 million mission announced today by NASA that is being led by the University of Colorado at Boulder to probe the Mars atmosphere for clues to past climates. In the largest research contract ever awarded to the University of Colorado at Boulder, the Laboratory for Atmospheric and Space Physics has been selected by NASA to lead a $485 million orbiting space mission slated to launch in 2013 to probe the past climate of Mars, including its potential for harboring life over the ages. The team, led by CU-Boulder’s LASP, will design, build and operate the Mars Atmosphere and Volatile Evolution mission, or MAVEN. Carrying three instrument suites, the spacecraft will probe the upper atmosphere of Mars and its interactions with the sun, said LASP Associate Director Bruce Jakosky, principal investigator for the mission. MAVEN will be the second mission of NASA’s Mars Scout program, a recent initiative by the agency for smaller, lower-cost spacecraft. In 2007, NASA launched the first Mars Scout Mission, the Phoenix mission that is now operating on the surface of Mars. The multi-phase MAVEN proposal by LASP was four years in development. Scientists will use MAVEN data to determine what role the loss of volatile compounds — including carbon dioxide, nitrogen dioxide and water — to space from the Martian atmosphere has played in its evolution, said Jakosky. The results should provide insight into the history of Mar’s atmosphere and water. MAVEN’s three instrument suites include a remote sensing package built by CU-Boulder’s LASP that will determine global characteristics of the upper atmosphere. A particles and fields payload built by the University of California, Berkeley, with support from LASP and NASA’s Goddard Space Flight Center, contains six instruments that will characterize the solar wind, upper atmosphere and the ionosphere — a layer of charged particles very high in the Martian atmosphere. The third instrument suite, a Neutral Gas and Ion Mass Spectrometer provided by NASA’s Goddard Space Flight Center, will measure the composition and isotopes of neutral and charged forms of gases in the Martian atmosphere. Lockheed Martin, based in Littleton, Colo., will build the MAVEN spacecraft and also will carry out mission operations for MAVEN. NASA’s Jet Propulsion Laboratory will navigate the spacecraft. LASP will provide science operations and data packaging and NASA’s Goddard Space Flight Center will provide management and technical oversight for the mission. Most planetary scientists believe Mars lost most of its atmosphere several billion years ago. The MAVEN orbiter will study current atmospheric loss with emphasis on the role of the solar wind, including its rapidly moving charged particles and magnetic field that may be responsible in large part for the current atmospheric conditions on the Red Planet, Jakosky said. CU-Boulder’s leadership heralded the achievement. Stein Sture, vice chancellor for research at CU-Boulder, echoed Peterson’s praise for the LASP team. The MAVEN science team includes three LASP scientists heading instrument teams — Nick Schneider, Frank Eparvier and Robert Ergun — as well as a large supporting team of scientists, engineers and mission operations specialists. MAVEN will include participation by a number of CU-Boulder graduate and undergraduate students in the coming years. Currently there are more than 100 undergraduate and graduate students working on research projects at LASP, providing training for future careers as engineers and scientists. NASA’s Mars Exploration Program was designed to help characterize and understand Mars as a dynamic system, including its present and past environment, climate cycles, geology and biological potential. The Mars Exploration Program is managed for NASA by JPL. For more information visit the Web at lasp.colorado.edu/maven and www.colorado.edu.